There are a handful of less obvious editing tools in iPhoto '09 that you may not have stumbled upon yet. Let's see how many of these five techniques you know. 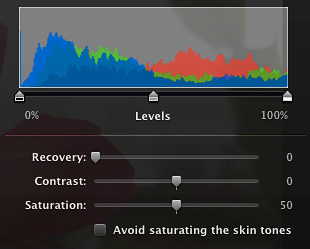 Recovery Slider -- If you open a Raw file in iPhoto '09, you have access to a highlight recovery slider. In editing mode, open the Adjustments panel, then hold down the Option key. The Exposure slider transforms into a highlight recovery tool, as shown in the graphic above. This only works with Raw files, however. Use Retouch Brush as a Clone Tool -- I'll warn you, this tip is experimental at best. First, click on the Retouch tool. You can adjust the diameter of the tool by pressing the right and left bracket keys. The Retouch tool can behave as a clone stamp if you hold down the Option key and drag over an area of the photo that you want to copy. Then go to another area of the photo where you want to apply the copy, and click and drag again. You should get a clone of the area you copied. The results can be unpredictable, but sometimes they are just what you need. You can return to Retouch mode by simply clicking on an area without dragging. If you totally mess up your image by playing with this, just go to Photos > Revert to Previous, and everything will be OK.
Fine Tuning the Enhance Tool -- The Enhance tool is fairly magical, but it can also be a mystery. Didn't you ever want to tweak it just a bit? Now you can. Open the Adjustments panel first, then click on the Enhance tool. In iPhoto '09, the modifications made by the Enhance tool will appear in the Adjustments panel. All you have to do is tweak the particular slider that you want to modify. Pay particular attention to the Exposure, Saturation, Shadows, Temperature, and Tint sliders. SHIFT Key to See Previous State -- Did you really improve the photo by making all of those adjustments? If you want to check your work, hold down the Shift key to see the previous state. Once you let go of the key, you'll return to the modified version. Targeted Zooming -- To zoom in on a particular area of a photo, put your pointer exactly where you want a closer look, then press the 1 key for a 100 percent view of that area, or the 2 key for an even closer look. Return to "fit into view" mode by pressing the 0 key. iPhoto '09 as Your Geotagging Tool? I'm always fiddling with my iPhone camera when I fly. This morning, as I was heading out of San Francisco on a twin-engine turbo prop plane, I was snapping pictures through the window to pass the time. As we rose above the clouds, this shot caught my eye because of the weird phenomenon that appears on the right side of the frame. These ribbon-like lines were visible on the iPhone screen and were recorded when I took the shot. I took two other frames and got the same effect. My guess is that they were created because of the angle of the lens, through double-pane glass, with the sun at just the right angle. But I don't really know what caused them. Unlike other optical aberrations, these ribbons are so distinct. The interesting part is that they are pretty in a odd sort of way. If anyone has a theory as to how they were created, please add a comment at the end of this post. 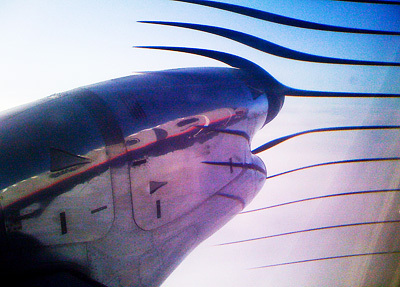 "Turbo Prop Engine with Ribbon Lines" by Derrick Story, captured with an iPhone. I just read an interesting piece on Strobist about how to make a homemade barn door for a LumiQuest Soft Box III. In the piece, Idea: SB-III Barn Door Mod, you first learn some good background information about using the LumiQuest (mounted on a shoemount flash) for portraits. Then, you see how to create a modifier out of gaffer's tape to further control the light. It's a fun and useful piece that I think you would enjoy. 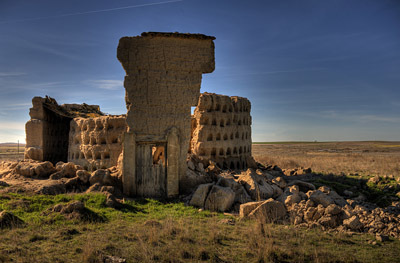 "This is a picture of an abandoned pigeon house taken in Otero de Sariegos, a ghost village located in the vast plains of Castilla, Spain," writes virtual camera club member Michel Bricteux. "It's actually composed of seven pictures bracketed at -2EV,-1 1/3EV, -2/3EV, 0EV, +2/3EV, +1 1/3EV, +2EV. Camera settings were ISO 400, 24mm focal length, f/7.1, 1/1000sec, with a Nikon D3 and a Nikkor 24-70mm f/2.8 zoom lens." "For the HDR post-processing, I used Photomatix Pro. It allowed me to keep details and texture in the highlights (mainly the sky) and deep shadows, giving this picture its intensity." If you're interested in HDR, you might want to check out this tutorial, How to Create High Dynamic Range images using Photomatix. It provides a good foundation and includes handy tips. Since it's so easy these days to create panoramas, why not make prints of them too? Red River Paper has put together an informative Print Inkjet Panos resource center that gives you the inside scoop on technique, printer set up, software, paper supplies, and web resources. Don't leave your panoramas trapped in your computer. Use these techniques to make giant prints with the inkjet photo printer you already own. If you'd like to take a Saturday to focus on your photography, then consider joining me in Santa Rosa, CA for "How I Did It" - A Short Course in High-Impact Photography on March 28, 10 am to 3 pm. Many high-impact photos are a combination of opportunity and technique. In this workshop, I'll show you examples of compelling photographs and explain how they were captured. By the end of the day, you will have learned many of the secrets that top shooters use to distinguish their work from others. You can register online, or call Santa Rosa Junior College at 707-527-4372. The course fee is $63. I'll have some fun photo accessories to give away, materials to browse, and will sign books too if you bring them along. I think you'll really enjoy this workshop. 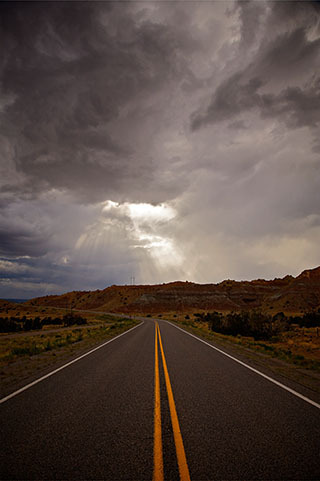 In a recent interview on Inside Digital Photo, I chat with Scott Sheppard about geotagging your photos, both from the hardware side and using software. During the interview I talk about the Jobo photoGPS, Eye-Fi Explore card, iPhoto '09 Places, Houdah’s HoudahGeo, and more. My interview starts about a minute into the show. You can listen by using the player button on the web page. The iPhone built-in camera can provide surprisingly good results. But since it's a fixed focal length lens, capturing the breath of big scenes can be difficult. Panorama stitching software can solve the problem by enabling you to take a series of images, either vertically or horizontally, then stitch them together to make one big picture. I've been testing Panorama by the iFone Guys, and does a great job of extending the capability of my 1st generation iPhone camera. When you first fire up the application, you're asked if you want to capture in landscape or portrait mode. This is a newish feature by the iFone Guys, and one that I much appreciate. I often like to capture in portrait mode because I feel the final images often look more realistic and less "pano." Once you choose your mode, you take a picture. Start at one end of the scene (Panorama will let you add photos in either direction). You get a preview of the image and are asked if you want to keep it. If yes, then you're provided with another screen that asks if you want to take another shot, and if so, in which direction. You're presented with a live camera again, but this time with a 1/3 overlay from the previous shot. Line it up with the next shot, and take another picture. Keep repeating this process until you have all of the images you need for your panorama. Then click the Finish button. You're presented with three output options. If you're shooting in Portrait mode, the options will be something like this for a 2-shot pano: 675x570, 900x760, or 1350x1140 -- add more pictures for more resolution. Tap the option you want, and Panorama builds your final image and saves it to your photo album. At this point, you can click the Done button, or go back and start another panorama. The stitching is phenomenal with this application. 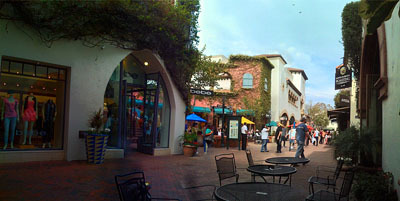 The above shot from a Santa Barbara shopping center is composed of 4 images captured in portrait mode using Panorama. You can see the full resolution version of it on my Flickr page. Click the "All Sizes" button and view the original size (1600 pixels wide). There's only one stitching flaw that I can see, and that happened because someone moved the chair during the sequence. You can also read more about Panorama on the iFone Guys web site. It is the most expensive iPhone application I've purchased at $9.99. But it works as advertised, and it has really extended my picture taking ability with the iPhone built-in camera. There were a handful of new announcements at PMA that made an impression on me, such as the Underwater Case for New Olympus E-620 DSLR and the Sony DSC-HX1 with its sweep panorama mode. 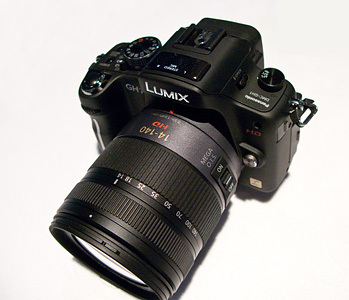 But my favorite new device is the Panasonic DMC-GH1 compact, interchangeable lens camera. Compatible with the Micro Four Thirds System standard, the new LUMIX GH1 features advanced video photography functions, such as the ability to record High Definition (HD) AVCHD 1080p/24p video. * In addition, the new LUMIX GH1 comes with a newly developed long-zoom interchangeable lens - the LUMIX G VARIO HD 14-140mm/F4.0-5.8 ASPH./MEGA O.I.S. This lens was specifically designed to support HD movie recording and features a silent motor and continuous auto focusing (AF) capability; two features which distinguish the LUMIX GH1 from DSLRs that offer HD video recording capabilities. This camera is super compact, supports Raw capture, feels great in the hands, has a swing out 3" LCD, includes a microphone jack, provides 12.1 megapixel resolution, supports multiple aspect ratios (4:3, 3:2 or 16:9), face recognition, includes O.I.S. 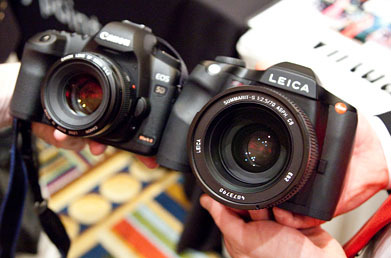 (Optical Image Stabilization) to help reduce blurring from hand-shake; Intelligent ISO Control to help limit motion blur by adjusting the ISO sensitivity, and Intelligent Scene Selector which automatically detects the five most common shooting situations - Portrait, Night Portrait, Scenery, Night Scenery and Close-up - then switches to the appropriate Scene mode. When you're recording video, you can use the stereo mics on top of the camera (as shown in the image above), or connect an external microphone via the minijack and mount it in the hot shoe. There's also a lens adapter that lets you use any four-thirds lens on this camera. So if you're an Olympus shooter for example, all of your lenses will work on the GH1, some at full functionality, others at partial. I shot with the camera in the Panasonic booth at PMA, and was impressed with its fit and finish. The video capture displayed on an HDTV was crisp and vibrant. It was difficult to set the camera back down. 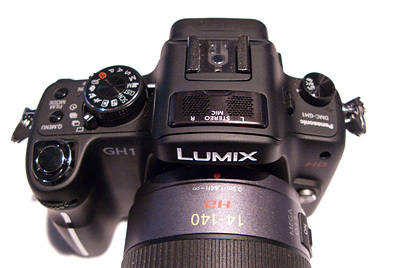 The Lumix GH1 should be available by summer. No price has been announced yet. You can read more about it on DPP via their hands on review of the GH1. There were some strong contenders at this year's show, but I think the Lumix GH1 takes the prize. The Sneak Peek at PMA was bustling with journalists from the minute the doors opened at noon. Oh sure, lots of food and drink had something to do with it. But lots of vendors displaying their best products with folks to answer questions was also a big draw. 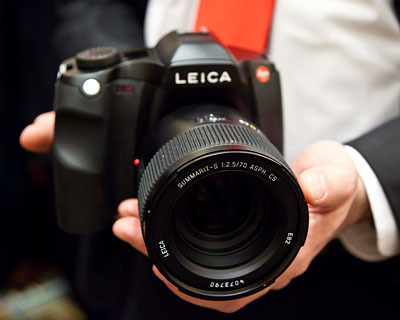 My favorite (in my dreams) innovation of the day was the latest edition to the Leica S System, the new Leica S2 Digital SLR. The Leica S2 features a dual shutter system with focal-plane for fast lenses and in-lens leaf shutter for high flash sync speeds, DNG capture that can be processed with Photoshop, precision autofocus system, and four interchangeable lenses. Bottom line, it feels like a digital SLR but produces medium format images. If you feel yourself getting excited about the prospects of owning one for yourself, this might cool you off a bit. Rumor is that the body will sell for around $40,000 when released later this year. Oh well, at least I got to hold it.